Features field recordings of Liberian work songs from the Mano Tribe. Voiceover samples of Mayamu Sirleaf + Massa Sirleaf recorded by e.g. bailey in Saclepea, Liberia. e.g. bailey debut mixes poetry, jazz, electronica, hip hop and more. With co-signs from Umar Bin Hassan of the Last Poets and the legendary Amiri Baraka, Twin Cities spoken word artist, poet, musician, organizer and educator, e.g. 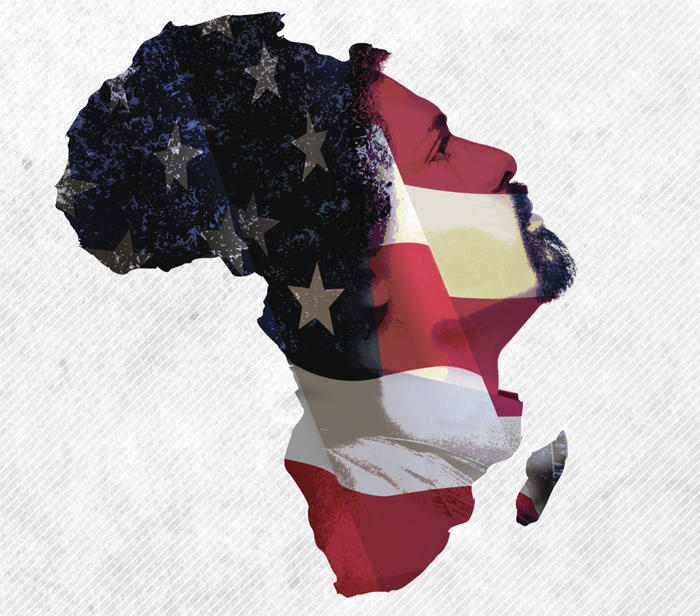 bailey, presents his first full-length album, AMERICAN AFRIKAN, a spoken word concept album that begins in Africa, crosses the Middle Passage, explores America and ends up somewhere that defies easy definition. Part musical theater piece, part audio chapbook and part performance art experiment, AMERICAN AFRIKAN mixes the beat-influenced poetry of bailey with music that blends hip hop, funk, jazz, electronica and more, creating a sound that is at once progressive and challenging yet smooth and listenable. You’d be forgiven for thinking that an hour-long spoken word album wouldn’t be much fun to listen to; many aren’t. But as Umar Bin Hassan says in the album’s liner notes, “The sounds on this album are just as important as the words.” Through bailey’s voice, through the Igbo nuns on ‘Oracles of Equiano’, through Aimee Bryant’s rendition of ‘Motherless Child’ and through the album’s diverse sonic palette, AMERICAN AFRIKAN succeeds not just as a piece of literature or poetry, but as a cohesive musical journey. Producer Katrah Quey, perhaps best known for his work with TC wordsmith M.anifest (who shows up to drop a verse on the ‘American Afrikan’ remix), handles a majority of that music, though Hipgnosis and DJ Limbs shine on a couple of early tracks. The beats compliment the words; sometimes fun and funky, sometimes dark and meditative––but always engaging. The album also features appearances by Twin Cities-based African poets, Ibé Kaba and Sankaradjeki; Mankwe Ndosi, singer for Atmosphere; Dubai jazz ensemble Abstrakt Collision; Midwest emcee Idris Goodwin and others. Deemed a true innovator of the spoken word art form, his charismatic yet rhythmic style dances words with sound in and out of synch with verbal play. One of the most prolific voices and talents in the Twin Cities, Bailey’s work has taken him on travels through the U.S., England, South Africa, France, Serbia and more. He has created spoken word work in film, theater, music and radio. Born in Saclepea, Liberia, and now based in the U.S., he is a founder of several foundational entitles in the local and national community including: MN Spoken Word Association, Tru Ruts Endeavors, the Urban Griots Spoken Word Awards, The Spoken Word and Hip Hop Institute at the University of MN. He has appeared in spoken word commercials including ‘Art Connects’, which premiered during the 2008 B.E.T. Hip Hop Awards, and was featured on the MTV, VH1, MTV Europe, CBS, NBC and other networks, in addition to being inducted into the Television Hall of Fame archived at the Modern Museum of Arts in New York. As he moves effortless between radio, film, theater, and producing, his live performances are always a treat. He can come on like a freight train. Words are his medium. He will make you laugh. He will make you cry. He will make you think. His name is E.G. Bailey and his brand-new release “American Afrikan” combines spoken word, poetry and music to explore what it is to be an Afrikan in America today. It doesn’t just skim along the surface in that exploration, it heaves from below like a bulldozer churning up slabs of concrete, tree roots and old asphalt in its quest — Bailey leading the narrative charge. Using language like John Coltrane used the tenor or soprano saxophone, Bailey — together with friends such as Aimee Bryant, Katrah Quey, Sha Cage, Hipgnosis, D.J.Limbs, plus African poets Ibe Kaba and Sankaradjeki; Dubai jazz ensemble Abstrakt Collision, and Mankwe Ndosi, the singer from Atmosphere — uses bits of pre-recorded sound, field recordings (including Liberian work songs from the Mano Tribe) and jazz. He rails, he whispers, he implores, he exhorts and subtly weaves his spell. “K Street Blues: The Bailout Plan” sounds like it could have been Sonny Rollins captured on the Williamsburg Bridge in 1952 talking to the skyline with his horn. Aimee Bryant’s stirring multi-tracked version of “Motherless Child” is a riveting take on this black spiritual. “Afrikan is the New American” has an almost Prince-like groove smothered in chicken grease. Bailey is the real deal. He has created spoken word dynamics in film, theater and recordings during his travels through this country as well as England, South Africa, France and Serbia. He is the founder of the MN Spoken Word Association, Tru Ruts Endeavors and the Spoken Word and Hip Hop Institute at the University of Minnesota. He’s been inducted into the Television Hall of Fame in the New York Modern Museum of Art. “American Afrikan” is not just a journey but an adventure that, during February’s Black History Month, explores identity, history, culture and what it means to be black in America today. The CD release of this wonderful piece of art takes place Saturday evening at the Bedlam Theatre in Minneapolis and should not be missed. Upcoming show: Saturday at 9:30 p.m., the CD release party at the Bedlam Theatre, Minneapolis. Cost $5. Ages 18 and older. Includes special guests Guante, Sha Cage, Mankwe Ndosi, Ibe Kaba and more. John Ziegler has worked in the music industry for the past 35 years as a radio host, interviewer, record producer and professional musician. Originally posted on Duluth News Tribune blog on 18 February 2010.
featuring Chasity Brown + J. Otis Powell! Noted Twin Cities poet and producer, e. g. bailey, started writing “Twin Towers” the morning of the 9/11 attacks. Eight years later, his evocative words seem even more resonant. Recording two versions of the track, one with bailey himself and one with renowned spoken-word artist, J. Otis Powell! 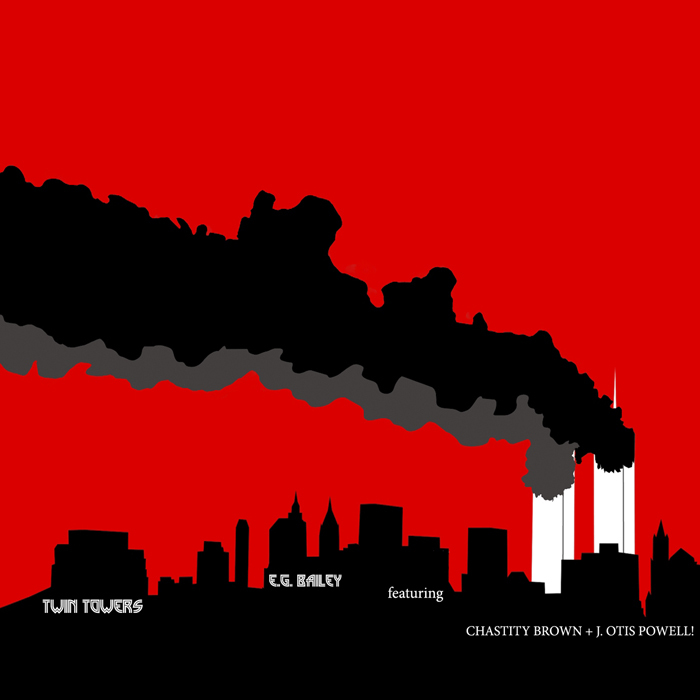 (both featuring singer songwriter Chastity Brown), bailey is releasing the track on September 11, 2009 in memory of those lost and for those who continue to feel the aftereffects of the attacks every day. Bailey’s ‘Twin Towers’ is a moving memorial encompassing the gravity of 9/11 from a 3rd person perspective while reverberating with a visceral sense of poignancy. It is an impressive yet poetic lament on this historic tragedy. Indeed, when Brown sings, “I watched the buildings crumble,” it’s not just the physical structures she’s describing. Likewise, “what monument will be erected to honor those we mourn?” refers to something deeper than steel and concrete. She is able to effortlessly bring e.g.’s melodies to life. The track also features an interpolation of Langston Hughes’ words describing the aftermath of the Battle of Stalingrad in his poem ‘Stalingrad: 1942’: “Out of the rubble from a dead hand lifted––/Out of the rubble from a lost voice calling––/I gather instead another world is falling”. “Twin Towers” honors those lost while asking the all-important question: how do our spirits respond to tragedy and injustice? 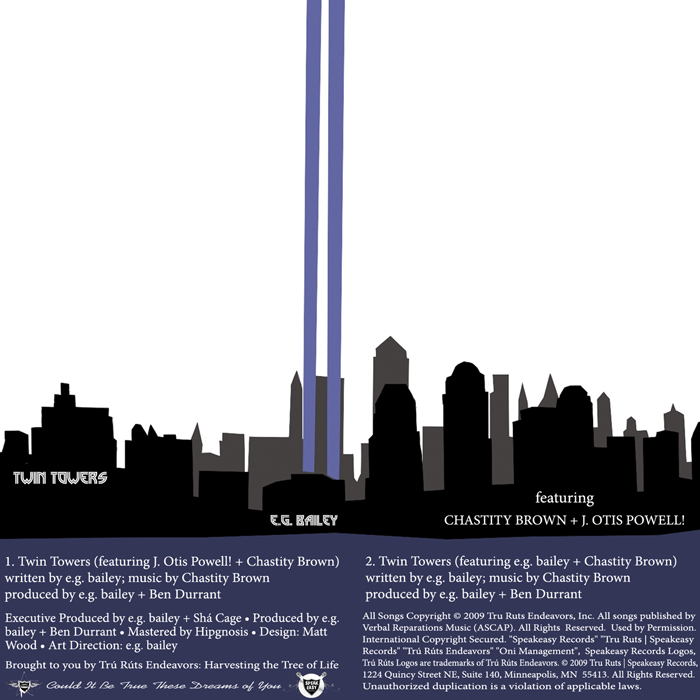 A testament to remembrance, peace and the power of the human spirit, the tracks are available online as free downloads at http://www.truruts.com. Brought to you by Trú Rúts Endeavors: Harvesting the Tree of Life. © 2009 Tru Ruts/Speakeasy Records. There is very little in the realm of Spoken Word that E.G. BAILEY has not done. One of the most prolific and innovative spoken word artists of his generation, he has been called a spoken word extraodinaire. Amiri Baraka states, ‘He makes language live.’ A multi-disciplinary Liberian American artist, who works in theatre, film, radio and spoken word, often mixing the different disciplines in his work, he has been creating work in these mediums for the last 15 years. As a performer he has worked solo, or with a band, dancers and vocalists. He is influenced by the jazz aesthetic and often works with jazz musicians, but has also worked with singer songwriters, and hip hop artists. He has been known arrived in a new city, gather an ensemble of musicians and improvise with them. He is both adaptive and versatile. He has not only created innovative works, but founded a number of endeavors and organizations that have provided opportunties for other artists. The core of his work, whether in theatre, music, film or radio, has been grounded in the art form of spoken word. He not only practices the art form but teaches, promotes, writes about and works to advance the art form. In his work, he specializes in studying and teaching the history of spoken word, and how it has developed from the griot tradition in Afrika, and influenced literary movements throughout time, including the Harlem Renaissance, the Beat Generation, the Black Arts Movement, the Slam Movement and others. He also teaches how it helped to create the Hip Hop Movement, and how it continues to influence artists–poets, musicians and filmmakers alike. He has produced over 15 albums and singles for a number of artists in spoken word and hip hop, and produced a noted and innovative National Poetry Month radio series for 9 years. He has developed radio formats and radio shows that promote poetry, spoken word and hip hop. In the same program, you may hear Claude McKay, Daara J, Linton Kwesi Johnson, Zap Mama, Fela, Common, Langston Hughes and the Last Poets. He is currently working on his album, ‘American Afrikan’, traversing experiences as a child born in Afrika and raised in America. It brings together Afrobeat musical stylings and spoken word, along with hip hop and other genres. It also has songs in Igbo (Nigeria), Mano (Liberia), and includes artists roots in Ghana, Guinea, Senegal, Tanzania and Germany. Part of the goal of the album is to highlight the talents of Afrikans living in the U.S., and also to show how Afrikans are influencing and changing America in the areas of music, politics and the literary arts. The first single from the album, called ‘America’, has already been well received. e.g.bailey has won awards in poetry, filmmaking, and radio, and has traveled to South Africa, England, Bosnia, West Africa, the United Arab Emirates and more for his work. He is a winner of the Hughes Knight Diop Poetry Award and several of his poems have been published in Solid Ground, the millennial issue of Drumvoices Revue, and Warpland, a publication by the Gwendolyn Brooks Center for creative writing. He is also the co-founder of the MN Spoken Word Association, Tru Ruts/Speakeasy Records, and Arkology spoken word and music collective. Most recently he was honored at the 2009 Urban Griots Awards for “Outstanding Contributions” to the spoken word art form. To learn more about e.g. bailey, go to www.truruts.com, www.egbailey.com, or www.myspace.com/egbailey. Chastity Brown is “…a roots soul singer of the first order,” as noted by music critic, Jim Walsh. With her folk-jazz style, this Minneapolis-based singer-songwriter has been steadily winning over her audiences since the release of her debut album, “Do the Best You Can.” Playing more than 150 dates in the past year, Chastity Brown has become known as a gospel-raised, activist poet who sings about race, love, and politics with an edgy tenderness. Her lyrics are both personal, infused with a deeply rooted spirituality, and politically, ethically hard hitting. She wrote her first song at age 15 in her home state of Tennessee and began her growing repertoire in public playing saxophone, piano, drums, and guitar. J. Otis Powell! is a writer, performer, educator, curator, producer, consultant and arts administrator. He is also a practitioner of Open Space Technology and has used OST for more than fifteen years with notable success in various productions, in educational scenarios, in administrative consultations and as a means to resolve conflicts. J. Otis lives and works in a jazz aesthetic while calling attention to the improviser in us all; the Open Space everywhere and artificial constructs that keep us from freedom. He is no longer preoccupied with what he has done and focused on who he is because of his experience.